And yes, you can make High Quality Biodiesel at home with this Ready to Run Processor. NOTE: Processor shown includes our Prodex Total Insulation which is a Very High quality, & very sharp looking. This processor is ready to start making biodiesel right away. With this processor you can completely finish a 40 gallon batch of biodiesel, (completely mist, bubble washed & Dried) in 2 1/2 - 3 days. Total hands on operator time is about 2 hours (average). Click HERE for links to information about everything from making biodiesel, to what it is, a sample timeline of running a batch & a full FAQ page. Comes with everything you need to start making biodiesel as listed below including detailed instructions to take you through the process step by step. You only need supply the chemicals, oil, barrel heater wiring & your buckets & barrels. See below for what you supply, but it's minimal. Just plug it in, hook up a few hoses and it's ready. You'll also need to hookup your oil heating element & thermostat in (1) 55 gallon barrels (you supply the new or used steel barrels) using the included instructions & parts. Be sure you compare carefully before laying down your hard earned money. We are so confident that you will be happy with your ready to run processor that we will make you this guarantee. If you are not happy with your processor for any reason, return it within 30 days for a full refund of the original purchase price. It's that simple. We know that you will love your EZBiodiesel ready to run Processor & we stand behind it with a 100% gaurantee. See details below. Refund Details- Does not apply to any DIY kits unless returned unassembled & showing NO signs of use or assembly. For DIY Kits, everything must be returned including tanks & stands. Poor instructions & minimal educational material. We provide you with a 90 page book that We Wrote with details all about biodiesel. The book covers many subjects from the history to benefits & drawbacks, oil collection, making & testing biodiesel, testing the oil before you collect it, & MUCH MORE. See HERE for more details about the included book. PLUS you get a dedicated users guide. Lack of a way to pre-heat the oil - pre-heating heats the oil for the reaction & allows you to pump it into the processor in the colder months. No method to de-water the oil before processing. De-watering minimizes soap formation in the biodiesel caused by water in the used cooking oil. And trust me, you don't want any more soap than neccessary. No method to pre-filter the oil before processing . Pre-filtering removes larger food particles, breading, etc, which hold water. Less water in the oil reduces soap formation which further reduces the chance of emulsions. Lack of enough agitation time - causing an incomplete reaction & excess glycerin in your fuel. INACCURATE scales - can throw your titration results way off, which can cause incomplete reactions, glop etc. Venting the methanol vapors into the workspace - We provide vents and hoses to allow you to vent your excess methanol vapors outside. There is minimal methanol vented, but it prevents any pressure buildup. No bubble washing system - The best way to wash the fuel, after mist washing. Recommended by the University of Idaho. No mist washing system - A way to gently wash the fuel and help prevent emulsions. Followed by bubble washing. Lack of thorough washing methods - Mist washing is very necessary, but doesn't do as good a job as bubble washing. But mist washing is the best way to start the washing process. Bubble washing has been shown to clean biodiesel more thoroughly than mist washing alone. NOTE: There is an ASTM standard for biodiesel which is ASTM D6751. And it has been shown that unwashed biodiesel WILL NOT meet this standard. But washed fuel does. Does it matter? If you want years of reliable service from your diesel it does. If you don't want to spend a lot of money on repairs due to coking & fouling of injectors, rings, valves sensors etc it does. See HERE to compare washed & dried fuel to unwashed fuel. No method to dry the finished fuel - After washing, there is some residual micro suspended water in the fuel. Not drying it will leave you with water in your fuel as seen in the photos in the link above. Poor Lye & Methanol mixing methods - We use a proprietary air powered mixer which swirls the methanol & lye to mix the two ingredients thoroughly. Pumps mounted improperly resulting in difficult priming. Our pumps only take a few minutes to get started the first time and even shorter times after that. Pumps mounted vertically require tedious priming procedures which often don't work since you can bleed the air out of the pump when it's mounted this way. Use of PVC valves - PVC valves have been known to harden, become brittle and break over time. Brass is much more durable. PVC is ok for plumbing EXCEPT for PVC ball valves. We have designed our processors to correct these problems and more. Click HERE to print this chart so you can use it to compare our processor to others on the market. Handles Most used or new Cooking oils? Designed for Proper Agitation time? Yes, timer allows more than 1 hour mixing time. Completely closed system and Fumeless? Comes with Bubble Washing setup? Yes, comes with everything needed to do accurate titrations including a way to accurately calculate the correct amount of the chemicals needed. NO. We include all the major parts you need and list everything you must supply to get started. Expandable to make larger amounts? Yes, with optional upgrade kit. Each expansion tank adds another 40 gallon capacity. Can add multiple expansion tanks in minutes. 2 We include thermostatically controlled heating elements that you hook up to (1) 55 gallon barrels with this systems. This is because heat is VERY important to the reaction process. You can make biodiesel without heat, but you risk making low quality fuel which could damage your vehicle. Requires some wiring skills, or an electrician, but it is important. This is still cheaper than a barrel band heater. We include a bubble washing system because it is a better method of washing your biodiesel, 'AFTER' you have done 1 mistwashing with the included mist washing system. If they only include one scale, it should be accurate to .1gm, and handle amounts up to 2000gms or more. If it doesn't It's not accurate enough. That's why we include 2 scales. One is for measuring your 1gm of lye for the reference solution, and the other is to measure up to 5000 grams for larger batches. 55 Gallon Conical bottomed reactor with removable lid. Screw on lid with seals keeps fumes in the tank, but allows you to look in, or add chemicals or oil through the top if needed. Also drains well due to the conical bottom. Comes with metal powder coated stands. Made of Industrial grade, chemically resistant Medium Density Polyethylene with U.V. inhibitors. Makes up to 40 gallons of biodiesel every 2 - 2 1/2 days. Visit our website for links to a sample timeline of the process. Methanol vent system. All of our tanks are vented to the outdoors via a vent in the tank & the lines to route it outdoors. This helps allow excess pressure to vent properly and safely away from the workspace. 4 Hour pump timer. Allows more flexibility in how long you run your pump. Great for drying the biodiesel, or if your oil temp drops and you need more than an hour of processing time. * A High capacity pump (720 gph). This pump picks up the prime easier, quicker & creates a better agitation due to the higher flow rate. Titration Calculator accurately telling how much lye and methanol to add. View in MS excel. Downloadable from our website on the links page. A mini batch kit, see below (for testing a small batch of collected oil before bringing home 30 gallons of possibly bad oil), etc. Handheld Infrared Temperature gauges to monitor oil temperatures. This handy handheld device will instantly measure the temperature of anything you point it at. Gives you the mobility to measure temperatures of wvo when heating it, the oil in the tank, etc. Insulated tanks and lines to hold the heat during processing. We insulate the upper portion of the tank with an high tech reflective blanket to help minimize heat loss during the reaction process. The primary pumping lines are also insulated. An Explosion proof Air mixer - Our proprietary mixer for the included Methoxide mixing tank pumps the methanol from the bottom of the tank back into the top at an angle, creating a very nice swirling effect for a safe, effective way to mix the methoxide mixture. We have built in screens to suspend the catalyst in the middle of the methanol solution for more effective mixing, while preventing it from clogging the bottom outlet. NOTE: you must supply an air compressor for this pump, but most people already have one. If not you can find them for about $120.00. We have these available as an option if you need it. Controllable input rate for the methoxide. Allows you to add the methoxide to the oil being recirculated in the large tank over a 15-30 minute time frame ensuring more complete mixing of the methoxide throughout the oil. Brass ball valves with teflon seats & stainless plated ball valves are used. All valves are labeled. 10 Micron Filter included to allow you to filter the final output before filling up your vehicle. STAINLESS STEEL Water Misting system built in. This single misting head is almost clogproof, durable & simple. Nothing to break on our misters. Just hook your hose up and your ready to mist wash. Comes with quick disconnects to simplify hookup. Bubble washing setup included. Includes a quick Disconnect to allow you to switch the water hose from the mister to the Quick Fill water intake. This unique method allows you to quickly add 10 gallons of water in minutes WITHOUT the possibility of an emulsion. This is accomplished by cascading the water down the inside of the tank wall, and not directly into the biodiesel. An EZBiodiesel exclusive. A Biodiesel Flash Drying setup to properly Dry your finished biodiesel along with instructions. This processor comes with a flash evaporation drying setup. Think of our drying system like this. If you were to open a gallon of Lacquer Thinner and let it sit until it evaporated it would probably take a week or more. BUT, if you pour it out on the ground and spread it all out it will dry in minutes. This is the concept behind our Flash Dryer. 55 Gallon Barrel Filter - This fits perfectly over the rim of a 55 gallon drum to pre-filter the used oil to remove the breading & food chunks before you pump it into your processor. Easily upgradeable to a higher capacity. We have upgrade kits available. Each additional tank adds another 40 gallon capacity to the system. Can be upgraded in about 10 minutes. Multiple upgrade tanks can be added. Multi Use Processor Pump - Setup to use the processor pump to fill the tank & provide the mixing and agitation. Then later it's used to transfer the finished biodiesel from the processing tank to the drying tank (your open top barrel) using a separate, clean intake line. This avoids contaminating the finished biodiesel with leftover wvo if you were to use 1 line for everything. The same pump then circulates the fuel while drying. All Parts are Guaranteed for 6 MONTHS. LIFETIME Free phone support, and unlimited free email technical support. Mini Batch Kit. Great for learning, and for testing unknown oils by making a mini batch first. Includes items in the list below. 2 syringes as another way to measure the oil, reference solution, etc. And our Spiral bound book, 'Biodiesel, What it is and how to make it' (click title to view a 26 page preview of our book). This book was written by us and is very informative & current with complete, thorough information to teach you all about Biodiesel. Also has a vinyl front cover (stays cleaner in the shop). The manual also lays flat for easy reading while making your first batch, etc. You'll also receive a handy Laminated Easy Reference Sheet for doing Titrations. You can even write your test results on the titration guide with the included china marker, then wipe it off when you're done. Plus you'll get a Laminated quick reference Processing sheet to remind you of the steps to take when making a large batch. And finally you'll get a detailed Users Guide which gives you information on maintenance, safety, final setup instructions & a step by step guide to making a large batch of biodiesel. That's all you need to supply to start making biodiesel with this processor. How long have they been in business? We've been in business for 9 months now & growing every day. We're going to be here for your support for a long time. Will your seller be? Have they sold any processors before? Is so was it a few, or many? We've sold over 100 processors from our website at ezbiodiesel.com, including internationally. Do they educate you about Biodiesel, or do they give you a simple set of instructions & just turn you loose? We provide you with a 90 PAGE book written by us, as simply as possible, to FULLY educate you about biodiesel. (Click HERE to view a 20 page sample of our book) You HAVE TO have a basic understanding of biodiesel to make it at home. While you don't have to be a chemist or a genius, you DO have to understand the process to make QUALITY fuel or you won't understand what's happening when something different comes up. And if you're using used oil, it will. You MUST de-water your used oil. All of our units have a de-watering setup & instructions. You MUST heat the oil before processing (and insulate the tank to HOLD that heat). Our processors all have an included thermostatically controlled barrel pre-heating setup (you supply the barrel), And the processor & lines are insulated to retain that heat. You MUST wash your fuel thoroughly. Unwashed fuel will NEVER pass ASTM standards. And mist washing alone is not as thorough as mist & bubble washing. You MUST dry your finished fuel. After washing the fuel clean, you will end up with some suspended water in the fuel. It must be removed, and our systems do this easily through Flash Evaporation in about 2 - 3 hours. Do they use quality components in their system? Some use PVC ball valves which degrade quickly, or they use thin wall hose on the pressure side of their pumps (ours are special order thick wall hoses), or they use non suction rated hoses on the suction side etc. Do they have an efficient methoxide mixing system? 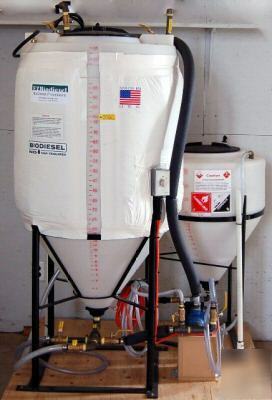 Our system uses an air driven pump for safety to swirl mix the chemicals thoroughly & easily. Support - Includes free phone support, and unlimited free email technical support. Questions - Feel free to contact us if you have any questions. If you want to purchase one of these, but need to call us first, call us at M-F 9am - 6pm. You can sometimes reach on at those hours on the weekends also. NOTE: we are in the MST time zone, so please adjust accordingly. Purchasers of these processors Assume All responsibility for their own safety. We provide you will complete safety information about the chemicals and products used in the biodiesel making process, along with the appropriate safety gear. It is up to the end user to properly educate themselves and to properly use the safety gear and procedures. EZ BioDiesel is always striving to produce the highest quality product possible. We therefore reserve the right to make changes to our products at any time. The actual system you receive 'may' have very slight design differences but will always meet or exceed all published claims and specifications.